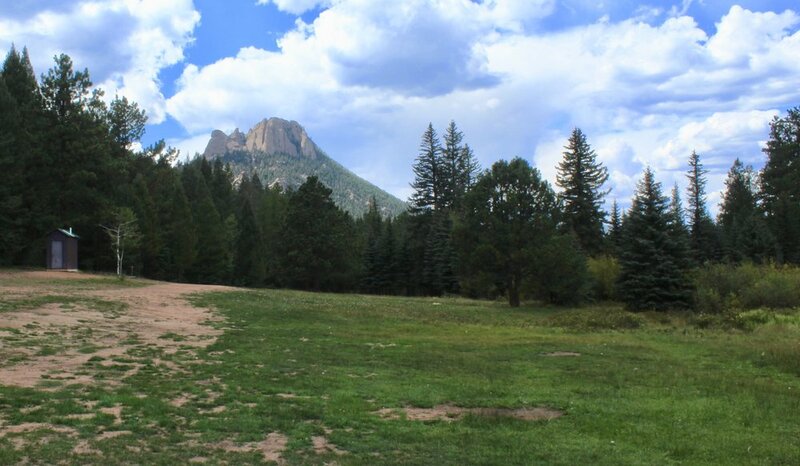 For larger groups, we recommend booking Royal Elk Meadow or the Scout Camp, which both offer ample space, seclusion, and beautiful mountain scenery for a memorable event! Royal Elk Meadow is located on the southeast end of the property and features two, beautiful grassy meadows in a secluded location with stunning views of The Castle. It is an easy walk, or very short drive, to the waterfront from Royal Elk Meadow, but the camping is not located directly on the lake. Royal Elk Beach has picnic tables and is the perfect location for fishing, swimming and launching watercraft. This area can accommodate up to 150 people and 50 vehicles. 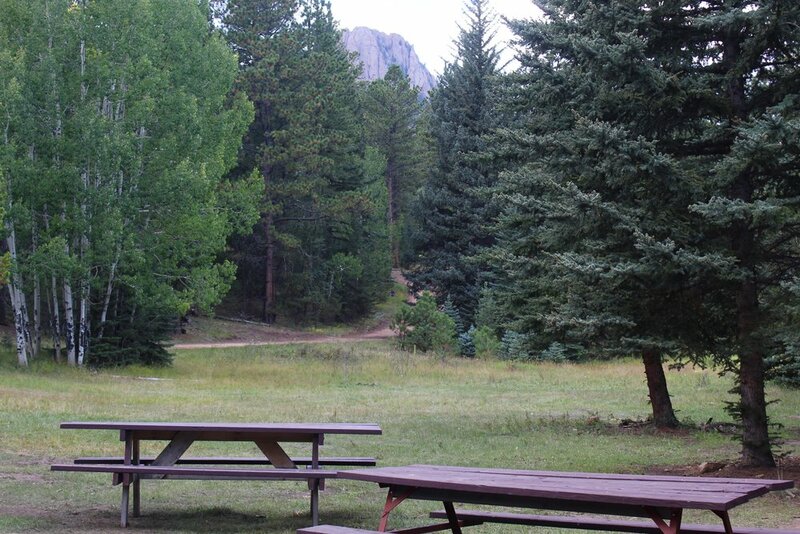 Royal Elk Meadow has two rustic vault outhouses (four stalls), picnic tables, and a large fire pit with bench seating. View of the Castle from the large camping area in Royal Elk Meadow. Private drive leading to Royal Elk Meadow in fall. The smaller camping meadow is an idyllic camping location. View of the Castle and the private drive from the smaller camping meadow. 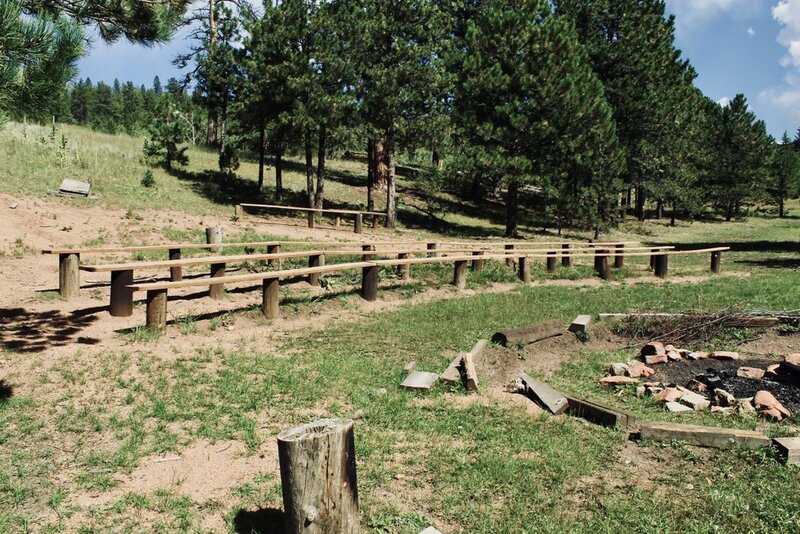 Royal Elk Meadow features a rustic fire pit and amphitheater area. A quick walk brings you to a nice grassy picnic area and beach. Scout Camp is located on the south end of the campground near the Waterfall Trail. It is often booked by Scout Troops, but can also be rented by non-Scout groups. It features a large communal fire pit and access to a small rock amphitheater. Scout Camp is an easy 5 minute walk to a day use area for water access, or you can hike about 10 minutes along the Lake Trail to a secluded beach.This area can accommodate up to 100 people and 30 vehicles.There are picnic tables and two rustic vault outhouses (four stalls). *There is a 2 night minimum for booking large group areas if your reservation includes a Friday or Saturday night. *Group organizers may be able to arrive a day early for setup and depart a day late for cleanup, based on availability. *A security deposit of $250 is collected at the time of booking. When there are no damages to the property or rule violations, this security deposit will be returned at the conclusion of the event. Full payment will be charged to the card on file 60 days in advance of the check-in date. *In the event of a cancellation requested more than 60 days in advance of the check-in date, the security deposit will not be returned, and the camping fees will not be charged. In the event of a cancellation requested within 60 days of the check-in date, only the security deposit will be returned, the camping fees will be non-refundable. *A valid Certificate of Insurance and a signed Recreation Agreement are required to book. Please reach out to us if you are interested in getting more information, checking availability, or creating a booking for your large group!